Exploration! Entertainment! Eating! There's a new upside to those pursuits in Durham. We unveiled a loyalty/rewards program Wednesday on the American Tobacco Campus. Scan QR codes around town, earn points and reap rewards with Bull City Buck$. It's sponsored by our downtown Durham neighbor, University Ford/Kia. An app is in the pipeline. For now, hit the website: www.bullcitybucks.com. And check out this Herald-Sun story for more details. QR (quick response) codes are a remarkable promotional tool. 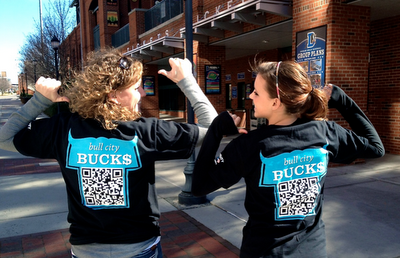 Bulls' staffers Mary Beth and Molly became human QR codes for the Bull City Buck$ kick-off. Yes, you could scan their t-shirts with your smart phone to register at the BCB website. They were good sports about the assignment, and it beat the alternative...wearing an old fashioned sandwich board sign.